While putting a monetary value on a great day of surfing can be seen as sacrilege to some, it can also provide an important counter weight to decision making that is often based on economic contributions, jobs, etc. Putting a value of surfing or other non-market activities (beach going, bird watching, etc.) can also be important when seeking compensation for recreation lost when beaches are closed or lost due to impacts from oil spills, water quality impairment, or coastal development. So how how to you measure the value of a day of surfing? 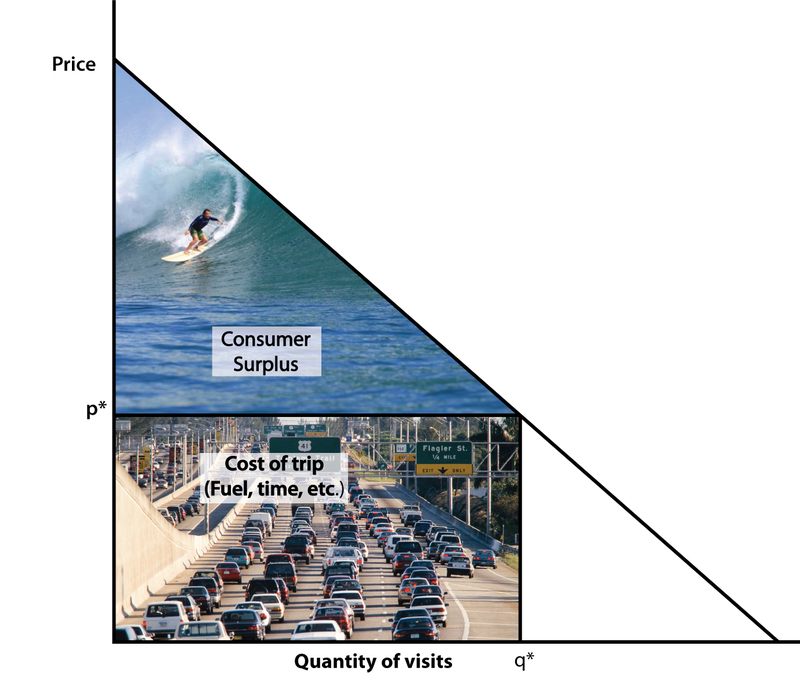 Since there is typically no market for access to surfing (access is free), resource economists have to estimate these values using other methods. One approach to capturing this value or "willingness to pay" for a day of surfing is the Travel Cost Method. The basic premise behind the travel cost method is that visitors who live farther away from a surf spot pay a higher travel cost and take fewer trips than visitors who live closer who can afford to visit more often. By modeling travel costs and the number of trips, we can develop a demand function for recreational use and estimate an average value that you, as a surfer, put on a visit to a surf spot. Economic theory presumes that if you spend 20 bucks on gas and three hours of your free time getting to a surf spot, that the visit is worth at least that time and financial commitment. As a result, the travel cost method measures the lower bound of this value; it could be higher. This average value is called the consumer surplus is the difference between the maximum someone would pay for a trip and the amount actually paid. In other words, the benefit you derive above and beyond the value of your time and travel costs. For example, in a previous post I wrote about a guy whose "willingness to pay" to spend an afternoon at Trestles was very high. Despite his high travel cost he believed it was worth it because the waves are so good. In the model schematic above, he would be found on the upper left region of the demand curve.